Established in 1996, we are a leading provider of industrial and commercial door systems and services across the country, supplying a broad and diverse customer base. Our unrivalled service support and product performance ensures our customers’ operations always run as efficiently as possible, and from this solid foundation our company has become relied upon nationwide as a provider of professional support. Our role as a national door company means our customers, from independent end users to multinational companies, use us as their single provider due to the wide range of services we provide. We attend to repairs and emergency call-outs all over the UK every day, and our unparalleled service and advice guarantees our customers the access and security they need. Our ability to supply, maintain and service every type of door on our customers’ premises means we also provide excellent convenience; with our range of expertise including roller shutters, fire shutters and automatic doors. At ABC Industrial Doors we have the personnel and expertise to create your door and shutter registers, and update them as we carry out service contracts and planned maintenance. We also have the resources and infrastructure to service large-scale property portfolios with thousands of doors. Furthermore, our commitment to nationwide door compliance protects you, your staff, and your customers. As well as our exceptional service we also have in-depth product knowledge at your disposal. This combination means we can advise the best access and security solutions, and then supply the highest quality durable products, to ensure the job is completed as effectively as possible. 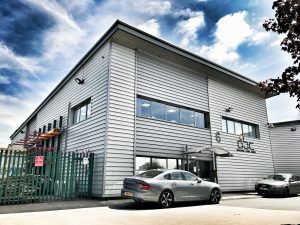 ABC Industrial Doors began in 1996, when our founder and managing director Ian Thomason decided to go into partnership with his good friend and fellow managing director Mark Todd. At the time Ian was a subcontractor for Henderson Doors, and Mark had just successfully completed an apprenticeship with Budenburg Gauge Company and an engineering degree at university. Business started very slowly, with no existing customers and only an advert in the yellow pages creating any incoming phone calls. It was through sheer determination to succeed and working tirelessly around the clock, often through the night and into the next day, that they found the key to their success. Now ABC Industrial Doors is in the enviable position of working with some of the largest and most well respected names in the UK. Today we are a highly professional accredited company, with huge nationwide engineer resources and in-house manufacturing capabilities. This transformation is testament to our number one priority from the beginning twenty years ago – customer satisfaction above all else. We will continue to grow as one of the leading suppliers of access and security door products and services, providing a one stop shop with the resources to deliver nationwide. As our customer base and work load increases we will recruit more quality engineers to service the calls. Ultimately, as each region reaches a certain point we aim to open regional offices to improve efficiency and customer service. We will keep you updated on any news of this exciting new stage of our evolution as it happens in the “ABC News” page.